This engine was built in 1911 by the American Locomotive Company of New York. It was one of four engines purchased by the Wisconsin Central in May, 1911. It was built light for passenger service. It weighs almost 100 tons. It was fired by a stoker and the tender held 12,000 gallons of water and 175 tons of coal and was able to maintain 200 pounds of pressure. It pulled up to 18 passenger cars and could reach 80 miles per hour. While in service No. 2714 logged over 2 million miles. It made runs from Fond du Lac to Stevens Point and Minneapolis. At one time it also ran between here and Winnepeg, Canada. The 800 mile trip to Winnepeg, (sic) was the longest continuous run of any steam engine in the United States at the time. This 79 (sic) year-old "iron horse" was moved to this site in July, 1955. About 20 volunteer Soo Line switch crewmen moved the locomotive to the Chicago & Northwestern tracks at North Fond du Lac. A Northwestern crew transported the engine from that site to a specially constructed spur, built by the same volunteer Soo Line crew, from the end of the Chicago and Northwestern Railroad spur agross the street from here to where the engine now rests. A Whiting car mover used at the Soo Line's round house moved the engine across the temporary tracks. The tracks and material upon which the engine now rests were donated to the city by the Soo Line. Three sister engines have since been scrapped. This engine was retired February 15, 1955 and donated to the city of Fond du Lac by the Soo Line and Wisconsin Central Railroad and dedicated July 4th of the same year. Refurnishing of this engine in 1990 was spearheaded by the Kiwanis Club of Fabulous Fond du Lac under the leadership of Jerry Brunere and Bob Kahl at a cost of $_0,500 and re-dedicated on July 4th of that year. Soo Locomotive No. 2714 is located at Lakeside Park at the intersection of North Main Street and Harbor View Drive, Fond du Lac, Wisconsin 54935. Soo Line Locomotive 2714 is a 4-6-2 steam locomotive and the only remaining one of four light passenger locos ordered by the Wisconsin Central in 1911. 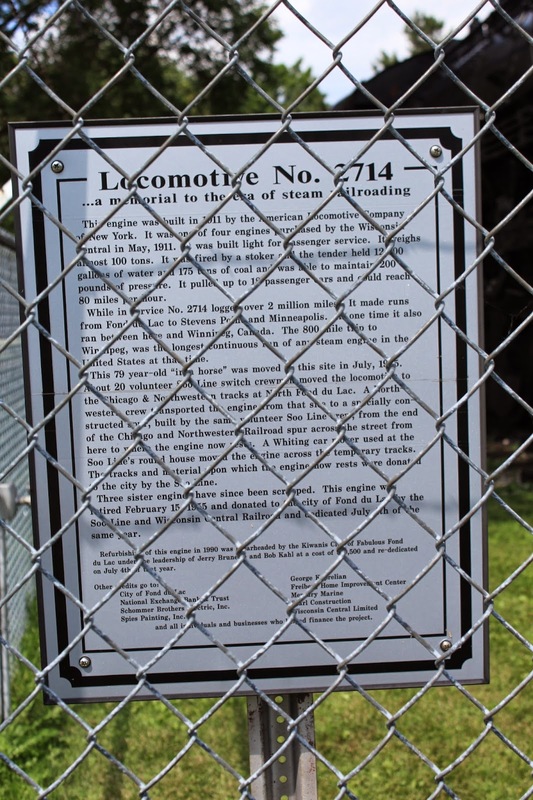 A sister locomotive, the 2719, has been restored to operating condition and is in excursion service in Duluth, Minnesota. When it is not in use pulling excursions, it is on display at the Lake Superior Railroad Museum in Duluth, Minnesota.